A brand new study by construction industry research non-profit Smart Cities Prevail shows that linking prevailing wage standards with proposed reforms to streamline new housing development would close the affordability gap, save state and local governments tens of millions of dollars annually, and disproportionately benefit communities of color. eNewsChannels NEWS: SACRAMENTO, Calif. — A brand new study by construction industry research non-profit Smart Cities Prevail shows that linking prevailing wage standards with proposed reforms to streamline new housing development would close the affordability gap, save state and local governments tens of millions of dollars annually, and disproportionately benefit communities of color. Read the study entitled “The Value of Linking Good Construction Jobs to California’s Housing Reforms” here (PDF): http://www.smartcitiesprevail.org/wp-content/uploads/sites/24/2017/03/SCP_HousingReport.0314.pdf. Overall, the study notes that it takes 13 percent more workers today to match the residential housing output that California enjoyed just twenty years ago. This steep decline in productivity has been matched by a 25 percent decline in inflation-adjusted blue-collar construction wages (the median wage is just $35,000 per year) and housing prices that have soared as high as 54 percent in the Bay Area. Prevailing wage is a minimum wage for blue-collar construction work that reflects local market rates for different skilled crafts. Long associated with stronger economic outcomes and more local hiring, most research shows that prevailing wages have no significant impact on total project costs because they promote higher skilled craftsmanship. This triggers increases in productivity and efficiency as high as 15 percent, reduced reliance on taxpayer funded public assistance programs, and prevents workforce shortages by helping to fund the apprenticeship programs that are used to meet California’s construction workforce training needs. * Increase incomes of blue-collar workers by more than $1 billion. * Boost state and local tax revenues by at least $55 million. * Save taxpayers at least $30 million on public assistance expenditures. With the Affordable Care Act facing an uncertain future, Lantsberg’s analysis shows that 38 percent of full-time, blue-collar construction workers currently have no health care coverage and their Medicaid reliance is twice the national average for non-supervisory production workers. According to Economic Census data, California’s 2014 Affordable Housing Cost Study and other federal data sources, construction wages and benefits comprise just 15 percent of total residential housing costs-substantially less than contractor earnings and developer fees (18 percent), and less than half the cost share of equipment, materials, fuels and purchased services (34 percent). Importantly, Lantsberg notes that neither labor costs nor materials have driven the increase in California’s housing prices. Since 1992 the construction industry’s gross operating surplus, or profits, have increased 50 percent more than either materials or construction labor. 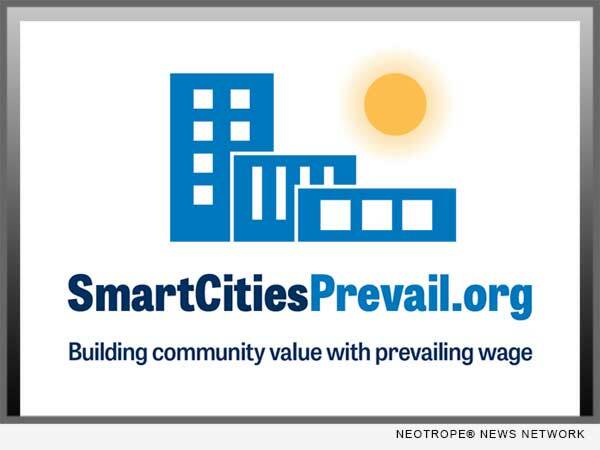 Learn more at http://www.smartcitiesprevail.org/ or by following us on Facebook: https://www.facebook.com/SmartCitiesPrevail – or Twitter: https://twitter.com/cacitiesprevail.